Most people, even those with no knowledge of electrician’s work, know that being an electrician takes all sorts of skills. You need to be good on the technical side as much as the organizational side. Plus, you need to know how to work precisely, carefully and safely. But that’s not enough. No matter how incredible you are at your job, if you’re self-employed, you need good electrician marketing. “Oh no,” you may be thinking. “Now I have to think of electrician marketing ideas, on top of everything else?” The simple answer is yes. Thankfully it’s not nearly as intimidating as it sounds. Before we dive into electrical contractor marketing ideas, we need to make sure your basics are covered. This means that beyond having good electrical business ideas, you’re prepared for good business practices. To begin with, you should make sure to have a contract drawn up. You can find a template for an Electrical Service Agreement online. Or, if you prefer, you can hire a lawyer to help you out, working on an agreed upon rate per project, or for a set number of hours, to ensure that you don’t run over your budget. The truth is, you should likely have a lawyer look over any contract in any event, to make sure all the details are there. 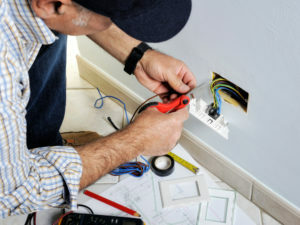 In addition, you’ll want to make sure your business is properly covered by electrician insurance. Whichever policy you choose, it should cover all the essentials. For your business, these include bodily injury, product completed, and property damage. Insurance shows you’re a professional, and when you’re dealing with electrical problems, you know that the unexpected can happen despite your best plans. All business ideas for electrical engineers should be summarized in a business plan. This plan is basically your blueprint for how you’re going to conduct business. It should include an overview of: your services, target audience, startup costs, monthly expenses, and sales goals. Note, there are plenty of business plan guidelines available for free online, if you need help getting started. Once you’ve got your business basics in place, it’s time to enter the realm of electrician marketing. For many electricians, no matter how experienced they are, this can be the hardest part. It’s not always easy to figure out where to advertise and how. Plus, some people are simply a little shy. So here are a few easy ideas to help get you started. Choose a memorable name – Your business needs a name. Luckily, the electrical contractor name ideas are endless. If your business is mostly through referrals, your first name may be enough. Customers will remember that friendly guy “Steve” who fixed their lights, and make sure to pass on his number. But if you’re planning on any form of advertising, you’ll probably need something more memorable. Just don’t forget, once you choose a name (especially if it’s a creative one! ), make sure you register it. Advertise your expertise – Yes, this sounds obvious, but some people need a reminder. Advertising is an important part of building your business, and you can do it in any number of ways. Of course, you can always put flyers in people’s mailboxes or pay for a radio spot. But there are also plenty more creative electrician advertising ideas worth exploring. For example, you can speak on a panel at a retirement home, run an Electricity 101 Workshop for women, or write a professional column for your local newspaper. Go digital – Advertising for electrical contractors does not end in the physical world. Many people will be searching for your services on Google. That means you’ll need to create an online presence as well. This could include any number of things. A simple website is always a good idea to start. You don’t need to write much. Just tell people who you are, what you do, and how to reach you. From there, you could link to a blog, where you can write short articles showing off your expertise. If you’re so inclined, you should also give social media a try. Create a strong LinkedIn profile, or perhaps a nice Facebook page. If you’re really ambitious and have the budget, you can also try geo-targeted Facebook and LinkedIn ads, which are ads that only show up to people in your area. Make sure they remember you – No electrician marketing would be complete without a business card. It’s your way of leaving your mark. Electrician business cards ideas are plentiful. You can go with the classic cardboard card that people tuck away in a drawer, or a magnetic card permanently posted on the fridge door, or even a magnet with useful information such as a calendar, to encourage them to keep it on their fridge. Whichever you choose, there are two things to always include – your name and your contact details. If there’s room, you may also want to list a couple of your main areas of expertise. Wear it proud – Consider yourself a walking billboard. Make sure the side of your van is painted with the same basic information as your calling card. Ditto for the shirts you wear on the job. And of course, don’t forget to ask your satisfied customers to take some extra business cards to share with friends and family who may be in need of an outstanding electrician, either now or at some point in the future. The bottom line is this: electrical contractor advertising ideas can be exceptionally simple, and cheap. So don’t be shy. Get out there and let the world know – many people are likely looking for an excellent electrician like you.